This Jigsaw Puzzle is for school going teens. This Jigsaw Puzzle is little tricky and will test your visual IQ. You have to be keen observer to solve this Jigsaw Puzzle. In this Jigsaw Puzzle, your challenge is to find the missing Jigsaw Piece taken from the Church Image. 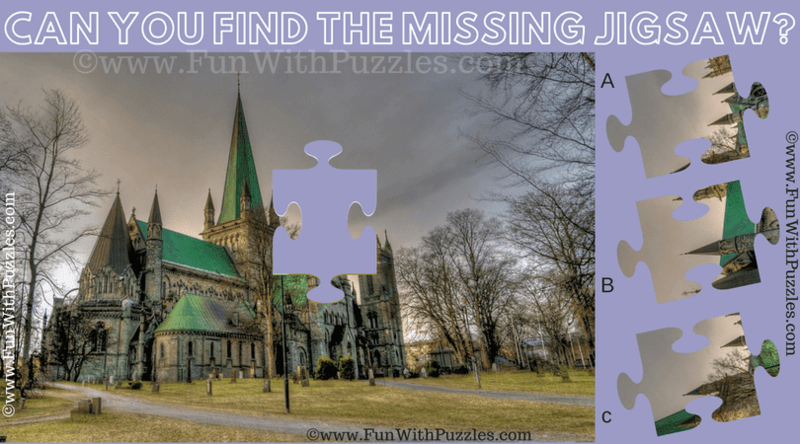 Can you find this Missing Jigsaw Piece and solve this Church Jigsaw Puzzle? Can you find the missing Jigsaw Piece in this Picture Puzzle? Answer of this "Church Jigsaw Puzzle for Teens", can be viewed by clicking on answer button. Please do give your best try before looking at the answer.